Oh, hey there...thanks for stopping by. Dead White Man’s Clothes is a multimedia research project exploring the secondhand clothing trade in the context of Accra, Ghana. This project is supported by The OR Foundation, a USA-based non-profit co-founded by us - Liz Ricketts and Branson Skinner. We have been working in Ghana since 2011 and 2009 respectively. After observing secondhand clothing in the streets and markets of Accra for years, we began this research in 2016 to learn more about how the “used” clothing trade functions and to better understand the environmental, social and economic implications of this industry in Ghana. We cannot stress enough that our work is specific to Ghana. Africa is not a country, and although we have traveled to several African nations we do not claim to understand the nuances of the secondhand clothing trade across the entire continent. While there may be similarities with other markets around the world, most of our research is specific to Kantamanto Market in Accra, Ghana. This is the largest “used” clothing market in Ghana and perhaps in West Africa. For a brief look into the market and the impact of secondhand clothing on Ghanaian society please watch the research ‘trailer’ below that we created in 2016 after our first trip dedicated to this project. To learn more about the secondhand clothing trade as well as our goals and general findings keep reading. We are White Americans and have a background in the fashion industry. We co-founded The OR Foundation in 2011 to liberate young people from the dominant consumer relationship with fashion - one of excess and exploitation - so it is safe to assume that we entered this research with an informed concern for the ecological impacts of the fashion system. This is important to note because no lens is neutral. It is also important to understand that this website has primarily been created for the gaze of people living in the global North, where the clothing is often collected before being exported to Ghana. That being said, all of our research has been informed by and completed in collaboration with Ghanaian citizens, whether they be government officials, market traders, consumers, designers, artists, retailers, importers, etc. Since October 2016 we have traveled to Ghana three times to collect data about secondhand clothing. We have conducted interviews with over 120 “used” clothing traders, importers and market leaders. We have conducted multiple surveys with both traders and consumers. We have toured the landfill and informal dumping sites where excess clothing is sent, and we have spoken with the director of solid waste management for the city of Accra. In addition, we have interviewed authorities at the Accra Metropolitan Authority, including the City Manager and a senior official from the Department of Planning. We have consulted with a former mayor of Accra. We have interviewed leaders of the major traders' associations affiliated with Kantamanto Market. We have also spoken with a senior executive at a major textile manufacturer in Ghana. We have documented our research via video and photography. We worked with Accra-based photographers Joshua Odamtten and Gideon Osabutey on numerous aspects of this research. We have several key partners in Kantamanto who have made this work possible. We would like to acknowledge Abena, David Adams and “Blackie” Boateng as three people whose expertise and kindness have informed much of this work. As we work to publish more of our research over the coming months in both video and written form on this website and other mediums, we want to offer an introduction to the world of Dead White Man’s Clothes. First, where does the name come from? Dead White Man’s Clothes is the translation of the Akan expression Obroni Wawu, which is a common term for secondhand clothes in Ghana meaning ‘the white man has died clothes’. This expression comes from the idea that someone would have to die to give up so much stuff, implying that the concept of excess was foreign. The secondhand clothing trade in Ghana can be traced back to the 1960’s. We have combed through the Ghanaian national archives looking for the earliest reference to secondhand clothing imports. What we found are dispatches from the Ghanaian Trade Mission in New York City detailing meetings with US businessmen seeking an outlet for secondhand clothing. This follows a timeline consistent with the expansion of shopping malls selling ready to wear garments and access to consumer credit across the USA. Secondhand clothing in Ghana has taken shape amidst the cultural balance of traditional Ghanaian dress and European style clothes, as the African nation gained independence from Great Britain in the late 1950s. What began as perhaps a few businessman over fifty years ago has turned into an industry providing some means of income - from dire subsistence to enormous wealth - to tens of thousands of individuals within Ghana alone. The secondhand clothing trade has greatly influenced cultural and socio-economic dynamics in Ghana, driving a shift from domestic industries and craftsmanship to fast paced consumption of global trends. Although nearly everyone dealing in secondhand clothes today knows that most of the clothing is originally given away by people who are still alive, we, Liz and Branson, think that this concept of Dead White Man’s Clothes speaks to the absurdity of the waste that we, a society, create as a byproduct of our exploitative overconsumption and overproduction. Abundance and excess are not the same thing. Overconsumption is not a burden carried entirely by the consumer. Overproduction is not a burden carried entirely by the producer. These phenomena are interconnected and affect all of us, regardless of our role or our position in the global North or South. Kantamanto Market and the landfills surrounding Accra are specific areas where the impacts of this cycle are greatly evident, but so too are the Malls of America and the High Streets of Europe. To consider the impacts of the secondhand clothing trade within Kantamanto Market and across Ghana and West Africa more broadly calls for the consideration of global supply chains and socioeconomic systems, systems indeed spawned by the White Man. Today Kantamanto Market, located in the center of the city of Accra, operates with high speed internet in the pocket of nearly every trader and with an increasing number of Malls reminiscent of suburban USA offering new shopping experiences around the sprawling city and suburbs of Accra. These new technologies and developments are changing the decades old secondhand clothing trade. Entrepreneurs scout out the best items from various market traders in order to sell at a markup on Instagram. Younger and wealthier customers spend time in the air conditioned malls. Whether or not they spend their money in the malls, the market scene of organized chaos that dominates Kantamanto Market is no longer the only place to buy European style clothes or to do business. How Accra as a society comes to balance the various tensions behind this evolving landscape is an important indicator of the city’s future ecologically and economically. The landscape of the secondhand clothing trade has deeply rooted connections all around the world. 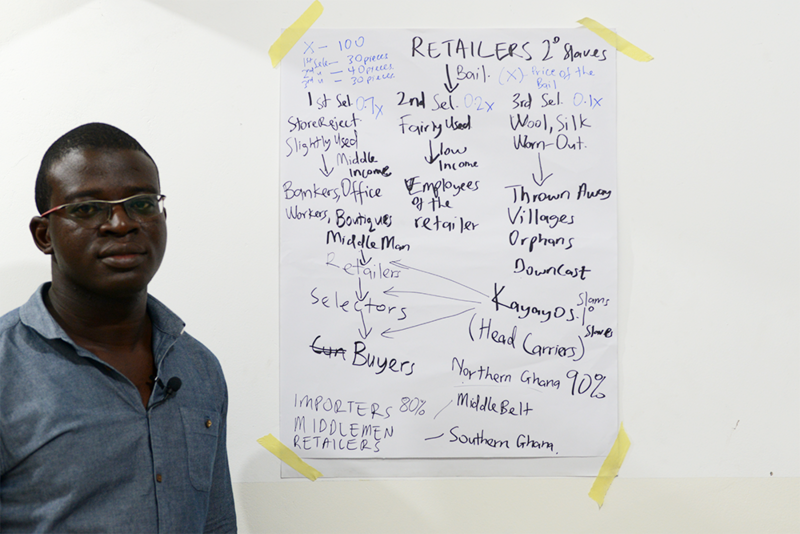 David Adams, a retailer of secondhand men’s suits who grew up in Kantamanto Market before studying biology at the Kwame Nkrumah University of Science and Technology, describes the secondhand clothing trade as an ecosystem. Super importers/European exporters work with local Ghanaian importers to move shipping containers full of bales into the center of Accra, along Ghana’s southern coast. Local importers work with middlemen/women to market individual bales. Kayayei (singular Kayayo), or head porters who are mostly women from the north of Ghana, move bales to retailers and storage managers. Retailers often work with tailors to alter garments to fit consumer demands. The consumer buys products for herself, or for resale amongst friends, family and a growing web of social media connections. What is leftover is picked up by waste managers or sent to rebalers who package items to be put back on trucks to ship to neighboring countries where the process starts all over. In some cases a local not-for-profit group might pick up some clothes from the market to distribute to clients for free. Most clothes end up in this system after the initial manufacture, sale and first life, when they are donated to a not-for-profit or a licensee of a not-for-profit in the global North. Fueling transactions within the secondhand clothing trade is the existence of waste and debt. ...Perhaps waste is a form of debt…. Retailers receive loans from friends, families, middlemen/women and financial institutions. Middlemen/women often operate entirely on credit, owing large sums to importers, who in turn often owe money to the exporters/super importers (as David calls them) abroad. When a market trader gambles on a bale (as described in our section on Kevin the Jeans Bale), he or she is putting this whole ladder of debt at risk. But should the ladder fall, the individual retailer has perhaps the least agency of all, save for the kayayei. David describes the kayayei and the retailers as the primary and secondary slaves of the whole system. We do not use the word slave lightly. Nor does David. What about the people wearing the clothes? For many Ghanaians, young and old, Kantamanto is the world’s greatest closet, allowing people to develop diverse visual and enclothed identities. We found that the price of clothing in the the market ranges from roughly 20USD to free, with a median of 1USD. Some outliers such as next-to-new mens suits or rare winter jackets might be priced upwards of 50USD. From photographers and stylists with a near endless selection of outfits for their work, to people engaged in manual labor who need inexpensive work-wear, to people with office jobs who can find unworn, deadstock suits for affordable prices, Kantamanto is seen by many people in Ghana as a positive source of affordable, quality clothing. A few creatives seek to use clothing from Kantamanto as the raw material for new designs, but for most Ghanaian fashion designers and clothing manufacturers, Kantamanto is often considered unfair competition. Is the secondhand clothing trade a recycling solution? No. We can definitively state that the existing model of the secondhand clothing trade in Accra, Ghana is not a method of textile recycling. Ghana currently does not have fiber-level textile recycling capabilities (few places do). Those who brand the secondhand clothing trade as ‘recycling’ are misleading the public and in some cases stand to profit from this myth. Is the secondhand clothing trade a model for the large-scale reuse of fashion? Not necessarily. Our surveys, interviews and observations indicate that roughly half of the clothing that passes through Kantamanto ends up in landfill almost immediately. This amounts to at least one million pounds of clothing going to the landfills surrounding Accra on a weekly basis. That’s not factoring in local post-consumer waste or the waste generated by other secondhand clothing markets in Accra or across Ghana. We prefer the term secondhand and we put “used” clothing in quotes because many items found in Kantamanto come unsold and unworn - deadstock - from their original retailers in the global North. In those cases we’d question whether reuse is an appropriate term at all. Yes, many millions of items are worn again (or for the first time) through the secondhand clothing trade, extending their life. 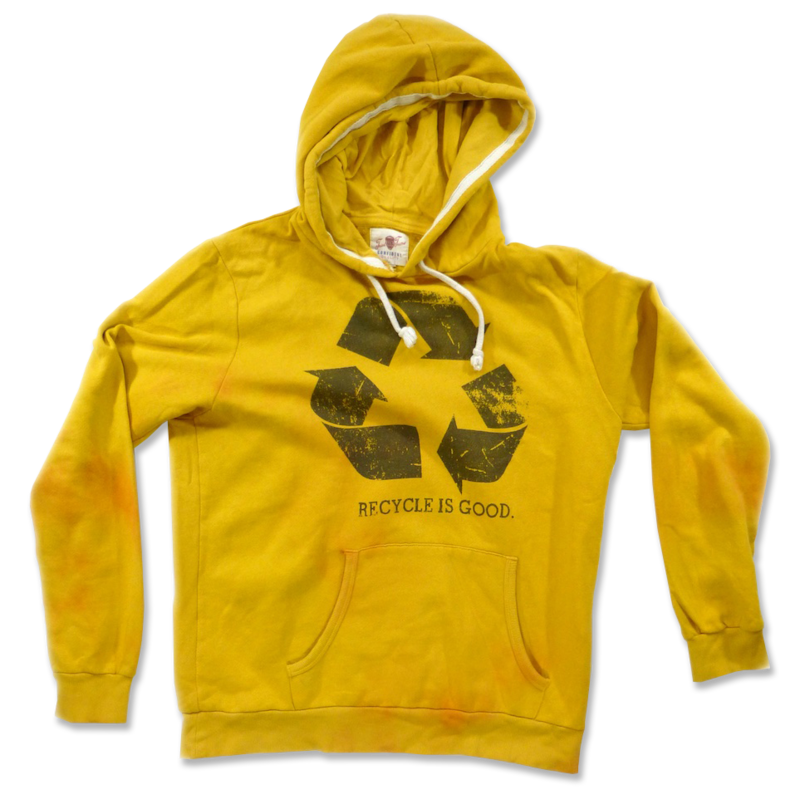 And yes, a relatively small number of items are upcycled into new products. But, with so much sent to landfill, to view the secondhand clothing trade in Ghana as an optimal outlet for reuse is simply misinformed. The reality that must be acknowledged, and openly discussed by everyone involved, is that the global North is relying on Ghana (and other nations) to take part in a waste management strategy necessitated by relentless overproduction and overconsumption. The question is whether justice is served by the position Ghana plays in this global system. While we acknowledge the benefits that the secondhand clothing trade brings to some people, we question the mentality that accepts the exportation of waste from the global North to the global South as a solution of any kind. Symbiosis and dependency are not the same thing. A power dynamic of superiority and inferiority is reinforced by the current structure of the secondhand clothing trade. Consider especially that the items sorted and sent to Ghana (and other places) are often the lowest grade of wearable items collected. 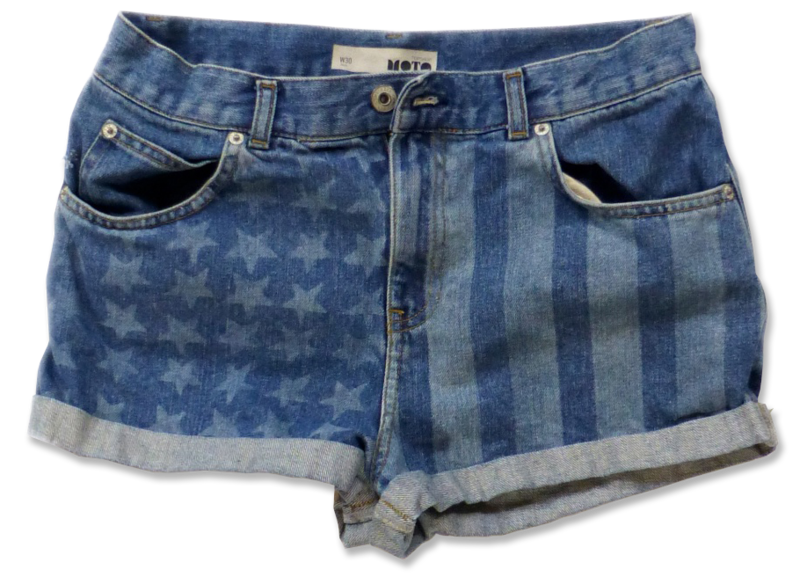 In some cases they are exported in unwearable condition. Historically colonialism on the Continent of Africa has taken place through resource extraction. When markets are flooded to such a degree that the donations of well-intentioned and often misinformed consumers in the global North are piled atop landfills, unwanted and unneeded, we wonder if waste dumping is the new colonial frontier? It doesn’t have to be. There is an opportunity to capture the abilities of market traders alongside burgeoning technologies and creative solutions in order to genuinely recycle textiles on the fiber level in a circular system. Yet ensuring that a future circular supply system is also a circular economic system - a system that equitably benefits the Ghanaian designer, retailer, consumer, and most vulnerable kayayo - is an immense challenge. Not only must circularity not become an excuse to continue socially exploitative practices with environmentally friendly material, a truly circular system is one that is not spawned yet again by the White Man. Rather it must grow organically from contributors around the world who have a part in bringing the clothing trade full circle. That is to say that a circular system must find roots natively in Accra through the ingenuity and hard work of Ghana’s citizens. We invite you to consider what we have presented here and how you can fit in. We will continue to update this site with documentation and analysis. In the meantime, please get in touch with us through our contact page or via instagram @theorispresent.